The agreement between the federal government and Pakistan Tehreek-e-Insaf (PTI) is a part of the strategy of the country’s Establishment which is playing a behind-the-scenes role in a bid to form a larger alliance of pro-federation parties to thwart any effort to sabotage the ongoing military operation against terrorists, militants wings in political parties and extortionists, Pakistan Today has learnt through reliable sources. “The decision to take the PTI leadership onboard was taken during a meeting between Prime Minister Nawaz Sharif and Chief of Army Staff (COAS) General Raheel Sharif held two days back when the premier was briefed how a conspiracy was being hatched to make controversial the operation of the law enforcement agencies in Karachi,” a well-placed source told Pakistan Today. 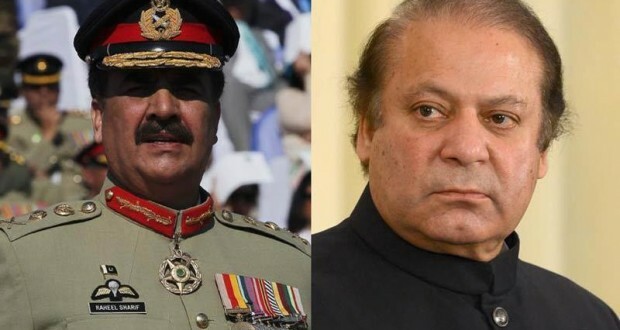 The source added that the COAS had briefed the prime minister about a conspiracy being pushed by pro-India and pro-western elements in political parties as well as in the civil society and non-governmental organisations to raise questions over the military operation to make the entire practice operation “highly partisan”. The source added that the army chief briefed the premier that “enemy state” was playing a behind-the-scene role to manoeuvre the situation and form an alliance of those political parties who may come under the focus during the operation for having militant wings or having ties with some criminal gangs. The source said that the “NGO mafia” had created an unnecessary media hype questioning the death sentence to a kidnaper and murderer, Shafqat Hussain, for being a juvenile when arrested. The government had to postpone the execution for Shafqat under media pressure. However, later all such claims proved false. “Now agencies have provided material suggesting that this campaign had been planned to damage the government’s push to execute terrorists and thugs because the enemy does not want to see peace and development returning to Pakistan,” the source added. The source said that both the leaders agreed to carry on the military operation against all terrorists and militants irrespective of their political, religious or sectarian linkages as the government wanted to purge the county of all sorts of law-violators. “The civilian and military leadership are on one page over their resolve to put an end to militancy and take the country to the path of development and progress as peace was a must to attract foreign investment and infrastructural development,” the source said. The source said that both the premier and the COAS agreed that the operation against militant wings and their abettors and corroborators would be taken to its logical conclusion to cleanse the port city of Karachi whatever it takes. “Later, Finance Minister Ishaq Dar also joined the meeting. Both the leaders were also briefed by Dar on the progress made on talks with PTI delegates. The civilian and political leadership also decided to take into confidence heads of other political parties. It was also decided that prime minister would contact with the leaders of the PPP and other parties so as no one could be misled about Karachi operation,” the source added. “The prime minister has not only agreed to form a judicial commission to come clean on the 2013 general election but he has also decided that other political parties of the countries would also be asked to sign the agreement along with PTI,” the source added. The source said that the decision aimed at curtailing any chance that PTI may steal the limelight. “In a bid to make the agreement as shared success by all political parties, prime minister will also contact other prominent political parties of the country including PPP, another political party which claims that the polls were massively rigged, so as the PTI may not claim the formation of judicial commission its sole success,” the source said, adding that the prime minister also wants to ensure that whether the rigging is proved or not, all parties may stand together and no party may claim it as its success. However, officials in the establishment were not available for comments on the issue. Under the Memorandum of Understanding (MoU) to be signed between the PTI and the PML-N government, a copy of which is available with Pakistan Today, a three-member high-powered judicial commission would be formed under a presidential ordinance as early as possible–preferably within 45 days of its first sitting. The commission would make its final report public. In a bid to win more political support for the MoU, the federal government has requested the leadership of the PPP and Balochistan National Party (BNP) to also sign the document. If the commission finds a country-wide pattern of rigging proved, the prime minister would dissolve the national and provincial assemblies in terms of the articles 58(1) and 112(1) of the Constitution – thereby meaning that the premier would also appoint the caretaker setup in consultation with the leader of opposition and fresh elections would be held. “The parties agree that in the event the Commission exercises the powers under section 6(2) of the ordinance, the head(s) of the Special Investigation Team(s) (hereinafter SIT) contemplated in the ordinance shall be appointed by the federal government after consultation with the PTI. The PML-N further agreed that simultaneously with the establishment of the SIT, noncontroversial, nonpartisan professional shall be appointed as heads of NADRA and FIA and that of the Election Commission of Pakistan (ECP) secretary shall also be replaced after consultation with the PTI after fulfilling the due process,” reads the MoU document. The PTI and PML-N have been bound not to question the credibility and functioning and both would be bound to accept the findings of the commission. The commission may also seek assistance from country’s top intelligence including the Inter-Services Intelligence (ISI), Military Intelligence (MI) or the Intelligence Bureau (IB). A source in the PTI told Pakistan Today that the PTI lawmakers would “most probably” return to the national and provincial assemblies once the judicial commission is formed and the commission starts probing the allegations of rigging. Moreover, the MoU also binds the PTI to rejoin the constitutional reforms committee already formed under the chairmanship of Senator Dar.